Keen Science stu­dent, Leanne Zhong who was awarded Senior Dux of Yat Sen Pri­mary School at the school’s prizegiving ceremony yes­terday hopes to chase her passion in fighting for the environment. At just 13, Leanne already knows what she wants to be­come in the future – an envi­ronmental scientist. “Climate change is a seri­ous issue now. I want to help reduce the effects of climate change and make the world greener,” she said. Leanne admitted that she had worked extremely hard throughout the year. 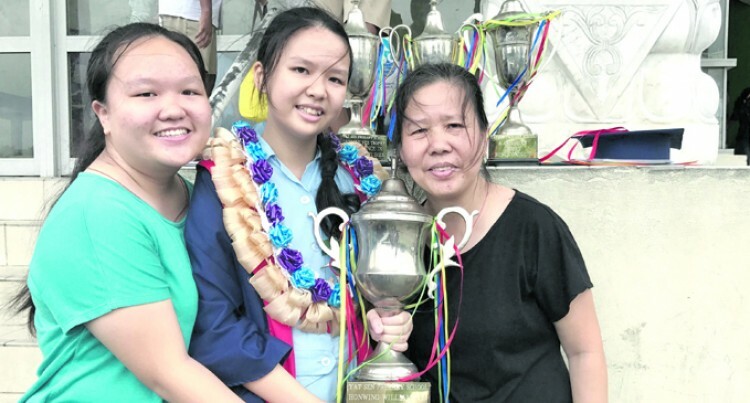 And her hard work paid off as she also took out the English and Basic Science subject prizes, the top award in Chinese studies and the award for best conduct. “It’s all my hard work and it’s all paid off especially those early morning and late night studies,” Leanne said. The Dux recipient said her family always provided overwhelming support, so she is happy to repay them with her academic achieve­ment. “We’ve witnessed her work hard this whole year and we’re really happy and proud of her,” Leanne’s sis­ter, Ca Kie Zhong said. Leanne also acknowledged her competitors who kept her inspired to keep work­ing hard.